1. Quiet your mind, relax your body. Pick a person you know and try to visualize what that person is doing. Note the time and check with that person later to see how accurate you were. 2. Sit quietly in a public place and pick out an area 10 to 20 feet in diameter surrounding you. Close your eyes and relax. Tell yourself to notice when someone enters the area. When you ‘feel’ someone enter your area, open your eyes to check your accuracy. 3. Make a plan to attract an event into your life. Choose a word, topic or phrase. Focus on attracting the word or phrase. You can ask the Universe or higher powers to help you attract it. Then stay observant during the day and watch for it to show up. It could appear in a song you hear, a conversation you overhear, be on a billboard or turn up in hundreds of different ways, so stay alert and watch for it. 4. Take a notebook and pencil or pen with you to a public place where you can sit down, for example a park. Sitting on the park bench, select a person nearby. Begin writing whatever comes to you about that person. Are they happy or sad, do they have children or pets, what type personality do they have, etc… Relax and just absorb what you feel from the energy around the person. This is just a practice exercise and does not need to be validated. You don’t have to approach the person to ask how your results compare to their lives. Just give yourself the practice of observing the energies of various people. 5. The doorbell rings, the phone rings, someone at work is walking in the hallway towards your office. Relax your mind and body. Close your eyes and picture the person on the other side of the door, in the hallway or on the phone. Then open your eyes, answer the phone or look for the person and see how close you were. Don’t get discouraged if you don’t immediately get the results you want. 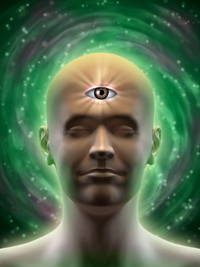 Using your psychic powers is like developing any type of skill; it takes practice. Keep practicing and over time you will find your abilities improve. The main thing is to enjoy the process and the exercises. Don’t concentrate as much on the results as on what you are doing to achieve them. The more fun you have with it, the more relaxed you will be and the more your unconscious channels will open. And don’t forget to practice, practice, practice! You can find more exercises to help you strengthen your psychic powers and abilities in our Psychic Development ebook.